Minister of Defence Zoran Đorđević has presented today awards to the safest drivers in the Ministry of Defence and the Serbian Armed Forces in the year behind us, and pointed out that the Ministry of Defence and the Serbian Armed Forces have traditionally paid significant attention to traffic safety. - Our members are investing significant efforts in the area of traffic safety, and the results of taking measures and activities in the previous period are measured by very favourable indicators - the Defence Minister said and especially praised the positive example given by the safest drivers who pass every year dozens thousands of kilometres without accidents and traffic violations. In the category of non-commissioned officers, Sergeant Major Miroslav Radojković from the "Cobra" Military Police Special Operations Battalion was declared the safest driver, as he drove 49.600 kilometres during the previous year without any traffic violations or accidents. In the category of professional soldiers, the top-ranking one was Corporal Goran Radojević from Kragujevac 2nd Depot Battalion of the Central Logistics Base, who crossed 35,919 kilometres driving special vehicles for transport of dangerous goods, while the safest driver in the category of civilians, during the last year, was Saša Mitrović from Belgrade Military Construction Institution who drove 86,265 kilometres at the steering wheels of different types of vehicles, without any traffic violations and accidents. Minister Đorđević invited them to share their knowledge generously with younger colleagues and added that it was his wish that we, as a ministry and part of the public administration, give a positive example to others in this very important area. - We should always strive to be better, which is especially difficult in your job which requires good concentration and alertness at any moment. On our part, besides the improvement of the normative part, we will work on renewing the car pool, the Defence Minister said, announcing "better times for all". Awards to the safest drivers were presented at the first session of the Council for safety of military traffic participants in 2017 chaired by the acting Assistant Minister for Material Resources Nenad Miloradović, PhD, and attended by representatives of the units and institutions of the Ministry of Defence and the Serbian Armed Forces, the Ministry of Construction, Transport and Infrastructure, Traffic Police Department, the Road Traffic Safety Agency and Belgrade Faculty of Transport and Traffic Engineering. Apart from the analysis of the state of road safety in 2016, which was presented by representatives of the Road Traffic Safety Agency, Lieutenant Colonel Aleksandar Gošić, MSc, presented the analysis relating to the safety of the military participants, with activities undertaken in this area in the year behind us. He presented a proposal for Methodology of introducing and monitoring indicators of the safety of military traffic participants, which was built on the basis of domestic and international experience. Members of the Council concluded that this year it is necessary to continue actions to improve the safety of military traffic participants, with a special focus on the participation of members of the Ministry of Defence and the Serbian Armed Forces in traffic, as drivers of vehicles in private ownership. The Ministry of Defense and Serbian Armed Forces pay a great deal of attention to traffic safety. For the purposes of making improvements as well as analyzing measures and results achieved in the field of traffic safety, every five years the expert conference on traffic safety is organized in the Ministry of Defense and Serbian Armed Forces. The 6th Expert Conference "Traffic and Transportation Safety in Ministry of Defence and Serbian Armed Forces" will take place on 18th May 2017 in Belgrade. The organizer of this expert conference is Logistics Department (J-4) Serbian Armed Forces General Staff. The aim of the conference is reviewing of the state of traffic and transportation safety in Serbian MoD and SAF. 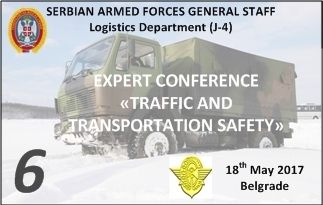 The expert conference is dedicated to traffic and transportation safety in military forces. The participants are competent individuals from traffic and transportation fields from the Ministry of Defense and Serbian Armed Forces, experts in traffic safety, as well as representatives from civilian institutions dealing with traffic safety in movement and transportation. Transportation of dangerous goods in MoD and SAF. The last such conference “Safety of Military Traffic Participants” held in 2011 was attended by a significant number of experts from the Army and society, with 66 expert papers presented. Participants of this conference were ECRAF President and Policy Secretary.